You only have to Google the phrase, “The need for leadership” to find out that there is a hunger for leadership. Anyone can take on the role of leader but what people really want is leadership. What are the characteristics of a good leader? Why does anyone want to become a leader? Why would you want to become a better leader? Who do leaders look to for leadership? 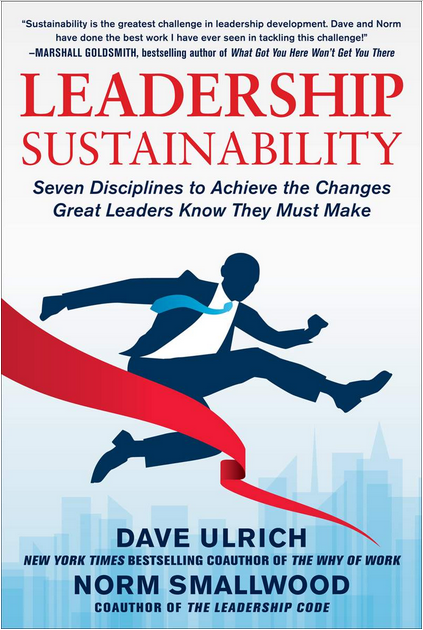 This isn’t the only book on leadership sustainability but it’s the only one that provides you with seven applicable principles or disciplines as the authors call them. From the very first words in the book (Preface), the authors challenge you to become a better leader. You’ve taken the first step by reading the book, Preface included. “Most good leaders want and try to become better,” the book begins and then goes on to explain how leaders attempt to become better by using leadership coaching, 360-degree feedback and other techniques to magically transform into a better version of themselves. As the authors acknowledge, few leaders ever put their learned techniques into practice over a sustained period of time. Additionally, the authors spare you the pain of consuming all 288 pages before you realize the benefit of their experience and knowledge. They tell you right there in the Preface what the seven disciplines are and a short synopsis of each. If you’re a quick start type, then be sure to read the Preface. Have I emphasized that enough? Perhaps, if I were to give the authors a bit of advice, I’d tell them to move the Preface to Chapter One and then start the book fresh with the first discipline in Chapter Two. Leadership Sustainability is a no fluff book that is far from a self-help pep talk from ivory tower types. This book gets to the nitty gritty and exchanges beautiful prose for practical information. If you like a no nonsense approach to your reading, you’ll love it. There’s no suspense, there’s no punch line and there’s no surprise ending but there’s plenty of good practices and clearly defined techniques for increasing your effectiveness as a leader. Ulrich and Smallwood present you with the seven disciplines in mnemonic format: START ME. Of course, there’s no shortcut to becoming a better leader and the authors acknowledge that. But if you apply yourself and focus on the seven disciplines that they outline, you’ll be able to sustain your leadership focus indefinitely. The layout of the book makes it easy to use as a reference. After you read through Chapter One’s introduction, background information, reference material and install the STARTME app, you jump right into Chapter Two: Simplicity. Chapter Two is arguably the most important chapter in this book. I suggest that you read it twice to be sure that you understand the concept and benefit of simplicity in leadership. The following six chapters present the other six disciplines: Time, Accountability, Resources, Tracking, Melioration and Emotion. And trust me, you haven’t explored these topics or concepts satisfactorily until you read their extraordinary presentations from Ulrich and Smallwood. If you think you know what each of the seven disciplines mean, you’re probably close but wrong. For example, do you know how to build simplicity? Exactly. You need to experience the process for yourself. In the book’s final chapter, Chapter Nine, you receive a leadership assessment. It’s not a 100 question self-assessment that you can guess the answers to or cheat by looking them up–nor is it a regurgitation of the book’s material in the form of questions. The authors ask you probing and thoughtful questions that you can use to examine yourself, your personality and your leadership style. For example, one of my favorite questions from Chapter Nine is, “How do you approach failure?” The point of the question is to examine yourself and to answer honestly. How you approach failure is not as important as how you will approach failure moving forward. To grow as a leader, you must always be willing to learn, to build and to assess what you’re doing and how you’re doing it. Now that you’ve finished reading the book, go back and read Chapter Two again and see if you can figure out why the authors put simplicity first in the book. I highly recommend Leadership Sustainability for anyone in a leadership position or for anyone who wants to develop leadership skills. Another look at leadership traits.